Source: Fourth International, New York, Vol.2 No.4, May 1941, pp.111-114. On-Line version: The diagram for the curve of capitalist development was taken from Richard B. Day, The Theory of the Long Waves: Kondratiev, Trotsky, Mandel, New Left Review, No.99, September-October 1976. Original on-line version: http://newleftreview.org/?view=352. Used here on the Leon Trotsky Internet Archive with permission from NLR. In Marxist literature this letter is most closely comparable to Engels’ famous letters on historical materialism. Here Trotsky takes the ideas expounded by the founders of Marxism; applies them to some basic problems of capitalist development; and thereby opens new paths and perspectives for the extension and use of the dialectical materialist method. The article itself grew out of Trotsky’s preoccupation with the specific political-economic problems presented to the revolutionary proletarian movement after 1921. This date marks the beginning of a period of relative stability within the USSR (the NEP) and in the relations between the young workers’ state and the capitalist environment, following the post-war revolutionary upheavals. Simultaneously with the establishment of the unstable equilibrium between the USSR and the capitalist world, that same world was shaken by a severe economic crisis. The conjuncture of these two contrasting events demanded a re-valuation of the possibilities of capitalist stabilization in connection with the prospects of proletarian revolution. Trotsky presented his answer to these problems in a report delivered to the Third Congress of the Communist International on The World Economic Crisis and the Tasks of the Communist International. In this report Trotsky attacked the reformist conception that capitalism could automatically reestablish itself on new foundations. “Faith in automatism of development,” he wrote, “is the most characteristic trait of opportunism.” He also derided the mechanical notion advanced by the then ultra-left wing of Bolshevism, that capitalism must continue upon its downward trend without interruption or reversal until its complete collapse. Against these one-sided appraisals, Trotsky presented the dialectical conception that the historical degradation of capitalism is characterized by sharp pulsations which conflict at critical points with the main descending curve of development. In the Comintern discussions, one group held that further impoverishment of the masses would generate new revolutionary crises; another, that a new flush of prosperity was required to invigorate the proletariat. Trotsky asserted that both of these formulations were one-sided and left out of account the mainspring of revolution. “Neither impoverishment nor prosperity as such can lead to the revolution, but the shifts of prosperity and impoverishment, crises, mutability, absence of stability – these are the motive factors of revolution.” It is the sharp turns in historical development which produce revolutions in social life – and the more abrupt the turn, the greater the revolutionary consequences. In his report to the Third World Congress, Trotsky elucidated this idea with specific reference to the revolutions of 1848, 1905 and the period of 1920-1921. The present article is a theoretical expansion and deepening of these earlier observations. It sketches in generalized form the dynamic interrelationships between the productive foundations of capitalist society and the events occurring in its superstructure. The problem Trotsky raised and the solution he indicated had not only great practical importance for revolutionary strategy in the class struggle but contained the widest significance for the development of Marxist thought. By 1922-1923 the epigones of Marxism, under Bukharin’s direction, had already begun to vulgarize historical materialism and to convert it from a tool of analysis into a new icon. They kept repeating old formulas instead of investigating new realities and reshaping the instruments of thought handed on to them by Marx, Engels and Lenin. Instead of advancing Marxist theory, these vulgarizers paved the way for its subsequent perversion at the hands of the Stalinist professors. In addition to its profound theoretical interest, Trotsky’s observations on the motive factors of revolution have the most immediate bearing on the present situation within the US. The war boom is producing deep dislocations in American economy and extreme shifts in all the decisive spheres of social life. Such swift and abrupt transitions from impoverishment to prosperity and back again, from war to peace and back again, are precisely the kind of social movements which give rise to crises of revolutionary intensity. Whoever wishes to grasp the innermost significance of current events should study with utmost care the ideas herewith presented by Trotsky as they apply to the present developments in the United States and to the world situation. – The EDITORS. ”If events and series of events are judged by current history, it will never be possible to go back to the ultimateeconomic causes. Even today, when the specialized press provides such rich material, it still remains impossible even in England to follow day by day the movement of industry and trade on the world market and the changes which take place in the methods of production in such a way as to be able to draw a general conclusion for any point in time from these manifold, complicated and ever-changing, factors, the most important of which, into the bargain, generally operate a long time in realms unknown before they suddenly make themselves forcefully felt on the surface. A clear overall view of the economic history of a given period can never be obtained contemporaneously, but only subsequently, after the material has been collected and sifted. Statistics are a necessary auxiliary aid here, and they always lag behind. For this reason, it is only too often necessary in current history to treat this, the most decisive, factor as constant, and the economic situation existing at the beginning of the period concerned as given and unalterable for the whole period, or else to take notice of only such changes in this situation as arise out of the patently manifest events themselves, and are, therefore, likewise patently manifest. So here the materialist method has quite often to limit itself to tracing political conflicts back to the struggles between the interests of the existing social classes and fractions of classes caused by economic development, and to demonstrate that the particular political parties are the more or less adequate political expression of these same classes and fractions of classes. These ideas which Engels formulated shortly before his death were not further developed by anyone after him. To my recollection they are rarely even quoted – much more rarely than they should be. Still more, their meaning seems to have escaped many Marxists. The explanation for this fact is once again to be found in the causes indicated by Engels, which operate against any kind of finished economic interpretation of currenthistory. It is a very difficult task, impossible to solve in its full scope, to determine those subterranean impulses which economics transmits to the politics of today; and yet the explanation of political phenomena cannot be postponed, because the struggle cannot wait. From this flows the necessity of resorting in daily political activity to explanations which are so general that through long usage they become transformed into truisms. As long as politics keeps flowing in the same forms, within the same banks, and at about the same speed, i.e. as long as the accumulation of economic quantity has not passed into a change of political quality, this type of clarifying abstraction (“the interests of the bourgeoisie”, “imperialism”, “fascism”) still more or less serves its task: not to interpret a political fact in all its concreteness, but to reduce it to a familiar social type, which is, of course, intrinsically of inestimable importance. But when a serious change occurs in the situation, all the more so a sharp turn, such general explanations reveal their complete inadequacy, and become wholly transformed into empty truisms. In such cases it is invariably necessary to probe analytically much more deeply in order to determine the qualitative aspect, and if possible also to measure quantitatively the impulses of economics upon politics. These “impulses” represent the dialectical form of the “tasks” that originate in the dynamic foundation and are submitted for solution in the sphere of the superstructure. Oscillations of the economic conjuncture (boom-depression-crisis) already signify in and of themselves periodic impulses that give rise now to quantitative, now to qualitative changes, and to new formations in the field of politics. The revenues of possessing classes, the state budget, wages, unemployment, proportions of foreign trade, etc., are intimately bound up with the economic conjuncture, and in their turn exert the most direct influence on politics. This alone is enough to make one understand how important and fruitful it is to follow step by step the history of political parties, state institutions, etc., in relation to the cycles of capitalist development. By this we do not at all mean to say that these cycles explain everything: this is excluded, if only for the reason that cycles themselves are not fundamental but derivative economic phenomena. They unfold on the basis of the development of productive forces through the medium of market relations. But cycles explain a great deal, forming as they do through automatic pulsation an indispensable dialectical spring in the mechanism of capitalist society. The breaking point of the trade-industrial conjuncture bring us into a greater proximity with the critical knots in the web of the development of political tendencies, legislation, and all forms of ideology. But capitalism is not characterized solely by the periodic recurrence of cycles otherwise what would occur would be a complex repetition and not dynamic development. Trade-industrial cycles are of different character in different periods. The chief difference between them is determined by quantitative interrelations between the crisis and the boom period within each given cycle. If the boom restores with a surplus the destruction or constriction during the preceding crisis, then capitalist development moves upward. If the crisis, which signals destruction, or at all events contraction of productive forces, surpasses in its intensity the corresponding boom, then we get as a result a decline in economy. Finally, if the crisis and boom approximate each others force, then we get a temporary and stagnating equilibrium in economy. This is the schema in the rough. We observe in history that homogeneous cycles are grouped in a series. Entire epochs of capitalist development exist when a number of cycles is characterized by sharply delineated booms and weak, short-lived crises. As a result we have a sharply rising movement of the basic curve of capitalist development. There are epochs of stagnation when this curve, while passing through partial cyclical oscillations, remains on approximately the same level for decades. And finally, during certain historical periods the basic curve, while passing as always through cyclical oscillations, dips downward as a whole, signaling the decline of productive forces. It is already possible to postulate a priori that epochs of energetic capitalist development must possess features – in politics, in law, in philosophy, in poetry – sharply different from those in the epochs of stagnation or economic decline. Still more, a transition from one epoch of this kind to a different one must naturally produce the greatest convulsions in the relationships between classes and between states. At the Third World Congress of the Comintern we had to stress this point – in the struggle against the purely mechanistic conception of capitalist disintegration now in progress. If periodic replacements of “normal” booms by “normal” crises find their reflection in all spheres of social life, then a transition from an entire boom epoch to one of decline, or vice versa, engenders the greatest historical disturbances; and it is not hard to show that in many cases revolutions and wars straddle the borderline between two different epochs of economic development, i.e., the junction of two different segments of the capitalist curve. To analyze all of modern history from this standpoint is truly one of the most gratifying tasks of dialectical materialism. Following the Third World Congress of the Comintern, Professor Kondratiev approached this problem – as usual, painstakingly evading the formulation of the question adopted by the congress itself – and attempted to set up alongside of the “minor cycle”, covering a period of ten years, the concept of a “major cycle”, embracing approximately fifty years. According to this symmetrically stylized construction, a major economic cycle consists of some five minor cycles, and furthermore, half of them have the character of boom, and the other half that of crisis, with all the necessary transitional stages. The statistical determinations of major cycles compiled by Kondratiev should be subjected to careful and not over-credulous verification in respect both to individual countries and to the world market as a whole. It is already possible to refute in advance Professor Kondratiev’s attempt to invest epochs labeled by him as major cycles with the same “rigidly lawful rhythm” that is observable in minor cycles; it is an obviously false generalization from a formal analogy. The periodic recurrence of minor cycles is conditioned by the internal dynamics of capitalist forces and manifests itself always and everywhere once the market comes into existence. As regards the large segments of the capitalist curve of development (fifty years) which Professor Kondratiev incautiously proposes to designate also as cycles, their character and duration are determined not by the internal interplay of capitalist forces but by those external conditions through whose channel capitalist development flows. The acquisition by capitalism of new countries and continents, the discovery of new natural resources, and, in the wake of these, such major facts of “superstructural” order as wars and revolutions, determine the character and the replacement of ascending, stagnating or declining epochs of capitalist development. Along what path then should investigation proceed? To establish the curve of capitalist development in its non-periodic (basic) and periodic (secondary) phases and to breaking points in respect to individual countries of interest to us and in respect to the entire world market – that is the first part of the task. Once we have the fixed curve (the method of fixing it is, of course, a special question in itself and by no means a simple one, but it pertains to the field of economic-statistical technique), we can break it down into periods, depending upon the angle of rise and decline in reference to the axis of abscissas (see the graph). In this way we obtain a pictorial scheme of economic development, i.e., the characterization of the “very basis of all the proceedings subject to examination” (Engels). Depending upon the concreteness and, detail of our investigation, we may require a number of such schema: one relating to agriculture, another to heavy industry, and so on. With this schema as our starting point, we must next synchronize it with political events (in the widest sense of the term) and we can then look not only for correspondence – or to put it more cautiously, interrelationship between definitely delineated epochs of social life and the sharply expressed segments of the curve of capitalist development – but also for those direct subterranean impulses which unleash events. Along this road it is naturally not at all difficult to fall into the most vulgar schematization and, above all, to ignore the tenacious internal conditioning and succession of ideological processes – to become oblivious of the fact that economics is decisive only in the last analysis. There has been no lack of caricature conclusions drawn from the Marxist method! But to renounce on this account the above indicated formulation of the question (”it smells of economism”) is to demonstrate complete inability to understand the essence of Marxism, which looks for the causes of changes in social superstructure in the changes of the economic foundations and not anywhere else. At the risk of incurring the theoretical ire of opponents of “economism” (and partly with the intention of provoking their indignation) we present here a schematic chart which depicts arbitrarily a curve of capitalist development for a period of ninety years along the above mentioned lines. The general direction of the basic curve is determined by the character of the partial conjunctural curves of which it is composed. In our schema three periods are sharply demarcated: twenty years of very gradual capitalist development (segment A-B); forty years of energetic upswing (segment B-C); and thirty years of protracted crisis and decline (segment C-D). 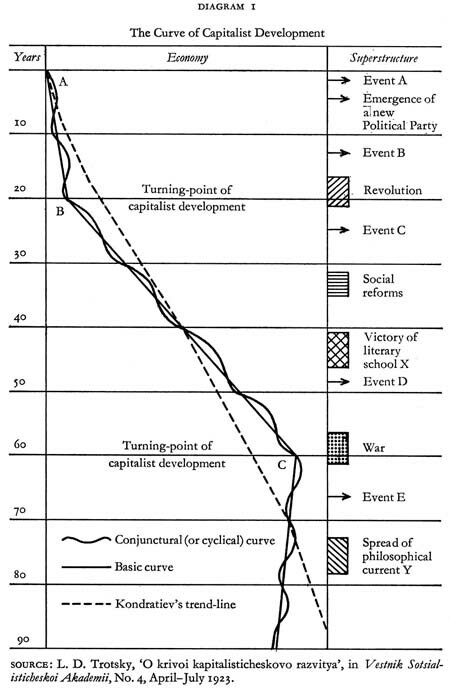 If we introduce into this diagram the most important historical events for the corresponding period, then the pictorial juxtaposition of major political events with the variations of the curve is alone sufficient to provide the idea of the invaluable starting points for historical materialist investigations. The parallelism of political events and economic changes is of course very relative. As a general rule, the “superstructure” registers and reflects new formations in the economic sphere only after considerable delay. But this law must be laid bare through a concrete investigation of those complex interrelationships of which we here present a pictorial hint. In the report to the Third World Congress, we illustrated our idea with certain historical examples drawn from the epoch of the revolution of 1848, the epoch of the first Russian revolution (1905), and the period through which we are now passing (1920-1). We refer the reader to these examples (see the New Course). They do not supply anything finished, but they do characterize adequately enough the extraordinary importance of the approach advanced by us, above all for understanding the most critical leaps in history: wars and revolutions. If in this letter we utilize a purely arbitrary pictorial scheme, without attempting to take any actual period in history as a basis, we do so for the simple reason that any attempt of this sort would resemble far too much an incautious anticipation of those results flowing from a complex and painstaking investigation which has yet to be made. At the present time, it is of course still impossible to foresee to any precise degree just what sections of the field of history will be illuminated and just how much light will be cast by a materialist investigation which would proceed from a more concrete study of the capitalist curve and the interrelationship between the latter and all the aspects of social life. Conquests that may be attained on this road can be determined only as the result of such an investigation itself, which must be more systematic, more orderly than those historical materialist excursions hitherto undertaken. In any case, such an approach to modern history promises to enrich the theory of historical materialism with conquests far more precious than the extremely dubious speculative juggling with the concepts and terms of the materialist method that has, under the pens of some of our Marxists, transplanted the methods of formalism into the domain of the materialist dialectic, and has led to reducing the task to rendering definitions and classifications more precise and to splitting empty abstractions into four equally empty parts; it has, in short, adulterated Marxism by means of the indecently elegant mannerisms of Kantian epigones. It is a silly thing indeed endlessly to sharpen and resharpen an instrument to chip away Marxist steel, when the task is to apply the instrument in working over the raw material! In our opinion this theme could provide the subject matter for the most fruitful work of our Marxist seminars on historical materialism. Independent investigations undertaken in this sphere would undoubtedly shed new light or at least throw more light on isolated historical events and entire epochs. Finally, the very habit of thinking in terms of the foregoing categories would greatly facilitate political orientation in the present epoch, which is an epoch that reveals more openly than ever before the connection between capitalist economics, which has attained the peak of saturation, and capitalist politics, which has become completely unbridled. I promised long ago to develop this theme for Vestnik Sotsialisticheskoi Akademii. Up to now I have been prevented by circumstances from keeping this promise. I am not sure that I shall be able to fulfill it in the near future. For this reason I confine myself in the meantime to this letter.